This black and white photograph looking west from the third block on West Central Avenue in El Dorado, Kansas. 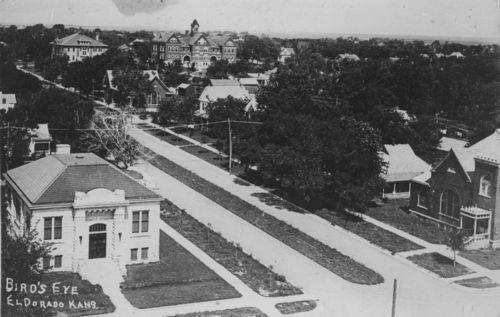 Carnegie Library is in the left foreground; Christian Church, right foreground; Old Presbyterian Church, left center; Mckinley School, left background. In the center background is the old Central High School. Picture was probably taken in the early 1920's.